Excursion to Masada and the Dead Sea: Masada cable car up the hill and walk down on the Roman Ramp, Masada Excavations, Sightseeing stop at the Dead Sea, Dead Sea Float! A dream comes true as your wide-bodied jet thunders off the airstrip. Your destination is Ben-Gurion Airport, near Tel Aviv. Tel Aviv has been called "The Biggest Little City" in the world! 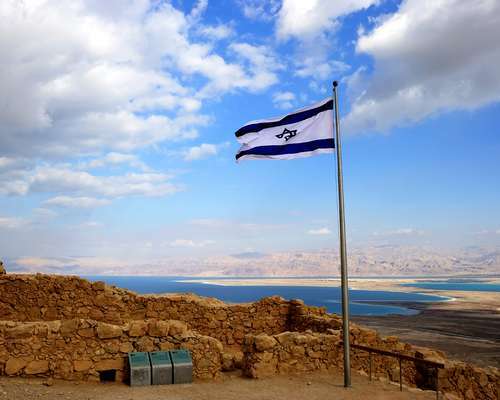 Ancient and modern, deep-rooted and cosmopolitan, it is both Israel's administrative and economic center (having served as its temporary capital city in 1948-49) and a fancy resort on the sunny shores of the Mediterranean. Head to Old Jaffa, the cradle of tel Aviv that was traced back to a 1800 BCE settlement on a coastal rocky ridge with a natural harbor, from which Jonah set sail (Jonah 1:3). Enjoy the ride along the coastal plain as you head north. Walk through the excavated city that King Herod the Great built roughly between c. 20 BC and 10 BC, and which he named in honor of his patron, Caesar Augustus. See the enormous Roman Theater, the ancient port, and the Crusader fortress. Step onto the ancient site associated with the Battle of Armageddon. Excavations have revealed 26 layers dating back to 3500 BCE. Devastated many times through history, Megiddo has come to represent the last battle between Good and Evil that's mentioned in the Book of Revelation. See it as it was in the time of King Solomon. Travel up Har HaKarmel, a mountain range called el-Muhraqa in Arabic. Stop in Muhraqa, a sacred site where the Prophet Elijah challenged the Prophets of Baal. Take in the panoramic view of the Valley of Jezreel, Samaria, and the coast. Proceed to Israel's third-largest city. Landmarks in Haifa include the Israel Institute of Technology, the Government Center with the elegant Sail Tower, and the world headquarters of the Bahá'í Faith, whose golden-domed Shrine surrounded by Persian gardens is now part of a UNESCO World Heritage site. Set out for Galilee, the region that was home to Jesus for the first thirty years of his life. Stop in the largest city of Galilee, where Jesus spent His boyhood. View the Grotto of the Virgin, site of the Angel Gabriel's apparition to the Virgin Mary, as you visit the Basilica of the Annunciation. 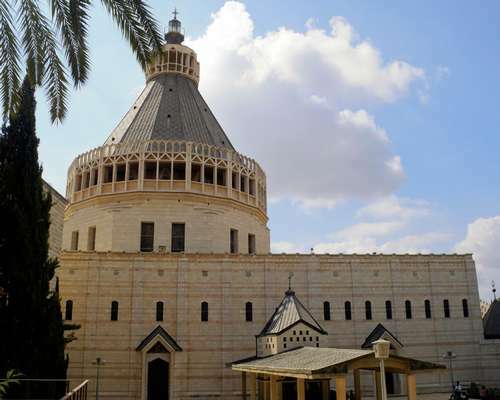 Holy sites in Nazareth are often inside churches, such as Mary's Well and Joseph's Workshop, with the exception of the public fountain that was built in town over an ancient well fed by Mary's Spring. Continue to the town of Kafr Kanna, identified by Christians as the biblical town of Cana. Visit the church built on the site of Jesus' first miracle, when He turned water into wine. Proceed to a fishing village that dates back to the time of the Second Temple and is associated with Jesus' ministry in Galilee. This tour will have you walking in footsteps thousands of years old on your way to the remains of a synagogue built on the foundations of a 1st century synagogue where Jesus taught (Mark 1:21). Walk into the church built over the excavated site of a first century house believed to have been the house of "Simon, called Peter," which served as a meeting place of early Christians. Drive on to the shores of the Sea of Galilee and to the city that was named Tveria in honor of the Roman emperor Tiberius. Journey down the Jordan Valley, past the Roman relics of Beth Shean. You're headed to the Qumran National Park, located in the Judean desert, at the foot of steep cliffs of on the shore of the Dead Sea. View caves where, in 1947, a Bedouin shepherd boy discovered the first manuscripts known as the Dead Sea Scrolls. They were written between the third century BCE and 68 CE, when the site was destroyed by the Romans. Continue to the Holy City, which recently celebrated 3,000 years of history since its establishment by King David as the capital of his kingdom. Head up to Mount of Olives, from which there's a panoramic view of the Old City of Jerusalem, basking in the sunlight. As you descend along Palm Sunday Road, you will visit the Sanctuary of Dominus Flevit, built on the spot where Jesus wept over the foreseen destruction of Jerusalem in 70 CE. The Hosanna Road also takes you through the Garden of Gethsemane, where Jesus spent a night in prayer after Judas' betrayal. Enter the Old City through the arch, also known as the Lion's Gate, which marks the beginning of the Via Dolorosa. On a walk along the Way of Sorrow, you will see notably the Church of St. Anne (a Crusaders' sanctuary from the 1130s); the Pool of Bethesda (where Jesus healed an invalid); the Antonia Fortress built by King Herod; the Ecce Homo Arch ("Behold the Man," per Herod's words); and the Lithostrotos (pavement) where Jesus was mistreated by Roman soldiers. 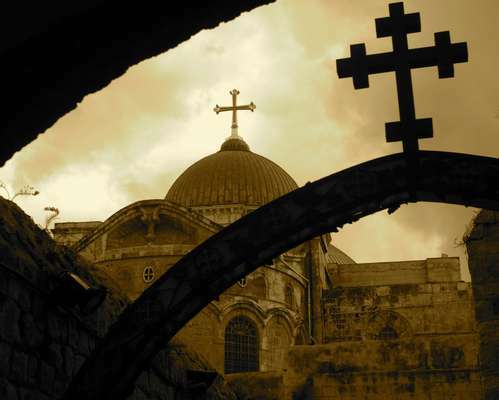 Set out on a stroll through the Old Jerusalem district known as the Christian Quarter. Visit Jerusalem's most sacred Christian sanctuary, which stands on the hill believed to be Golgotha, or Calvary, site of the Crucifixion. Within the church, a chapel known as the Edicule was built over the tomb traditionally regarded as the Tomb of Jesus, site of the Resurrection. A well-known market (souk) lines King David Street, where souvenir seekers can find something to please every taste. Proceed to the hill known both as the Western Hill and as Mt. Zion. It rises south of Jerusalem's Old City, near the city walls. Although the biblical Mt. Zion, with the remains of the City of David, lies to the east, the modern Mt. Zion also bears sacred sites. Visit the most important room in Christendom, also called the Cenacle. It's traditionally regarded as the site where the Last Supper was held and where the Holy Spirit descended upon the Apostles - an event that marked the birth of the Christian Church. Below the Upper Room, you will view the traditional site of King David's Tomb, which is a place of pilgrimage for Jews, Christians and Muslims. You may want to walk along ancient lanes in the footsteps of the prophets, and deepen your understanding of this unique, centuries-old Holy City. 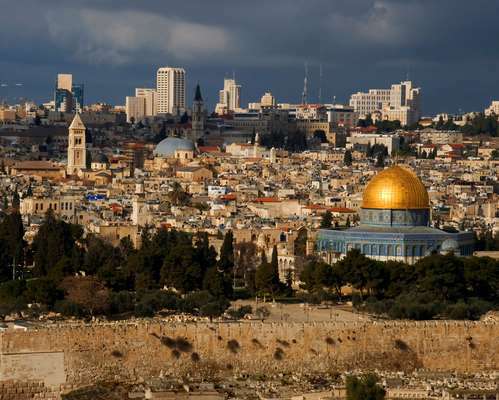 There are enough religious and historical sites to fill several trips to Jerusalem. Travel to the Judean desert's natural fortress of Masada, which has been described as a site of majestic beauty and as one of the greatest symbols of the ancient kingdom of Israel. Ride up to the Herodian fortress built on top of an isolated rocky promontory. There, in 74 CE, 960 Jewish rebels withstood three months of siege by 15,000 Roman soldiers, and in the end chose death over surrender. Your walk back down the hill twill take you along the path known as the Roman Ramp. See the excavated ruins of palaces and baths, of an ancient synagogue and of as a chapel built by Byzantine monks. Continue to the the lowest place on earth. Wade in Yam Hamelach (the Sea of Salt), where water evaporates faster than it can be replenished by the River Jordan. It's salty, so you'll float easily! And you may reap health benefits as both water and mud are hailed for their healing properties. This sea isn't really dead: despite the elevated salt level, minute forms of life are sustained by freshwater springs on the seafloor. 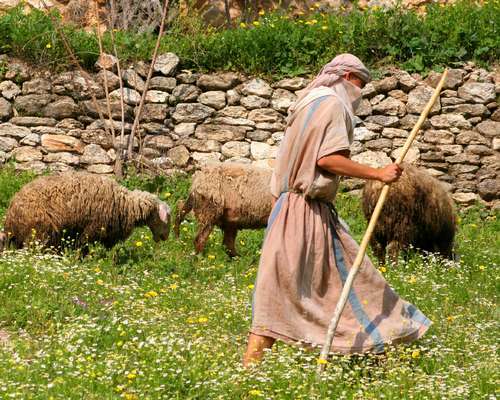 Today, discover the fertile valley of Elah where, for centuries, shepherds have watched over their flocks, and farmers have grown crops and tended vineyards, as they do to this day. In this valley, as the Bible tells us, a young shepherd slew an invincible giant. Not far away, the Israelite warrior Shimshon was betrayed by a beautiful Philistine woman, who cut off his hair, source of his strength. Consider a visit to the Israel Museum to view its best-known exhibits: the Shrine of the Book (Dead Sea Scrolls) and the famous Model of the City of Jerusalem during the Second Temple Period. Most good things must come to an end. 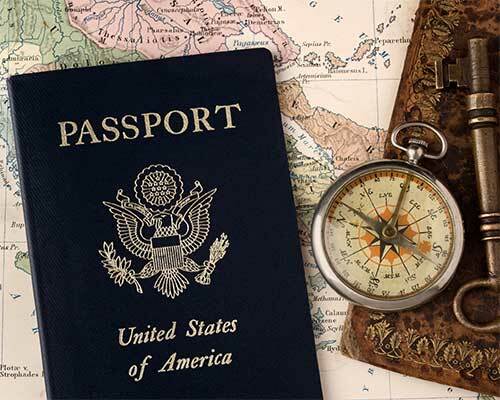 In a few days you have traversed thousands of years, seen the holiest of sites in the land that fostered the world's three monotheistic faiths, and walked alongside members of diverse groups who all belong to the People of the Book. You'll arrive home later today, eager to share your discoveries with family and friends.